Self-portrait of Peale (c. 1791) at the National Portrait Gallery in Washington, D.C.
Charles Willson Peale (April 15, 1741 –February 22, 1827) was an American painter, soldier, scientist, inventor, politician and naturalist. 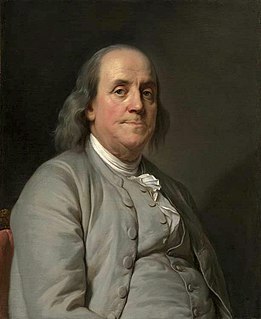 He is best remembered for his portrait paintings of leading figures of the American Revolution, and for establishing one of the first museums in the United States. A museum is an institution that cares for (conserves) a collection of artifacts and other objects of artistic, cultural, historical, or scientific importance. Many public museums make these items available for public viewing through exhibits that may be permanent or temporary. The largest museums are located in major cities throughout the world, while thousands of local museums exist in smaller cities, towns and rural areas. Museums have varying aims, ranging from serving researchers and specialists to serving the general public. The goal of serving researchers is increasingly shifting to serving the general public. Peale was born in 1741 between modern-day Queenstown and Centreville, Queen Anne's County, Maryland,  the son of Charles Peale and his wife Margaret. He had a younger brother, James Peale (1749–1831). Charles became an apprentice to a saddle maker when he was fourteen years old. Upon reaching maturity, he opened his own saddle shop  and joined the Sons of Liberty. However, he was unsuccessful in saddle making. He then tried fixing clocks and working with metals, but both of these endeavors failed as well. He then took up painting. Queenstown is a town in Queen Anne's County, Maryland, United States. The population was 664 at the 2010 census. Finding that he had a talent for painting, especially portraiture, Peale studied for a time under John Hesselius and John Singleton Copley. John Beale Bordley and friends eventually raised enough money for him to travel to England to take instruction from Benjamin West. Peale studied with West for three years beginning in 1767, afterward returning to America and settling in Annapolis, Maryland. There, he taught painting to his younger brother, James Peale, who in time also became a noted artist. 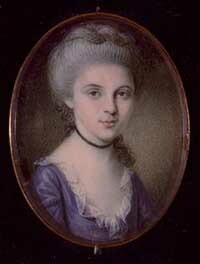 John Hesselius (1728–1778) was a portraitist who worked mostly in Virginia and Maryland. He was the son of the Swedish-born portraitist Gustavus Hesselius. John Beale Bordley, was a Maryland planter and judge. Peale's enthusiasm for the nascent national government brought him to the capital, Philadelphia, in 1776, where he painted portraits of American notables and visitors from overseas. His estate, which is on the campus of La Salle University in Philadelphia, can still be visited. He also raised troops for the War of Independence and eventually gained the rank of captain in the Pennsylvania militia by 1776, having participated in several battles. While in the field, he continued to paint, doing miniature portraits of various officers in the Continental Army. He produced enlarged versions of these in later years. He served in the Pennsylvania state assembly in 1779–1780, after which he returned to painting full-time. La Salle University is a private, Roman Catholic university in Philadelphia, Pennsylvania. Named for St. Jean-Baptiste de La Salle, the university was founded in 1863 by the Institute of the Brothers of the Christian Schools. The university offers traditional, online, and hybrid courses and programs. 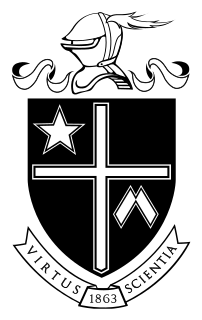 The university is affiliated with the Roman Catholic Church through the Archdiocese of Philadelphia. Peale was quite prolific as an artist. While he did portraits of scores of historic figures (such as James Varnum, Benjamin Franklin, John Hancock, Thomas Jefferson, and Alexander Hamilton), he is probably best known for his portraits of George Washington. The first time Washington sat for a portrait was with Peale in 1772, and they had six other sittings; using these seven as models, Peale produced altogether close to 60 portraits of Washington. In January 2005, a full-length portrait of Washington at Princeton from 1779 sold for $21.3 million, setting a record for the highest price paid for an American portrait. James Mitchell Varnum was an American legislator, lawyer, general in the Continental Army during the American Revolutionary War, and a pioneer to the Ohio Country. "The career of Gen. Varnum was active, but brief. He graduated at twenty; was admitted to the bar at twenty-two; entered the army at twenty-seven; resigned his commission at thirty-one; was member of Congress the same year; resumed practice at thirty-three, and continued four years, was elected to Congress again at thirty-seven; emigrated to the west at thirty-nine, and died at the early age of forty." John Hancock was an American merchant, statesman, and prominent Patriot of the American Revolution. He served as president of the Second Continental Congress and was the first and third Governor of the Commonwealth of Massachusetts. He is remembered for his large and stylish signature on the United States Declaration of Independence, so much so that the term "John Hancock" has become a synonym in the United States for one's signature. One of his most celebrated paintings is The Staircase Group (1795), a double portrait of his sons Raphaelle and Titian, painted in the trompe l'oeil style. It is in the collection of the Philadelphia Museum of Art. Peale had a great interest in natural history, and organized the first U.S. scientific expedition in 1801. These two major interests combined in his founding of what became the Philadelphia Museum, later known as Peale's American Museum. It housed a diverse collection of botanical, biological, and archaeological specimens. The museum contained a large variety of birds which Peale himself acquired, and in many instances mounted, having taught himself taxidermy. In 1792, Peale initiated a correspondence with Thomas Hall, of the Finsbury Museum, City Road, Finsbury, London proposing to purchase British stuffed items for his museum. Eventually, an exchange system was established between the two, whereby Peale sent American birds to Hall in exchange for an equal number of British birds. This arrangement continued until the end of the century. The Peale Museum was the first to display a mastodon skeleton (which in Peale's time were referred to as mammoth bones; these common names were amended by Georges Cuvier in 1800, and his proposed usage is that employed today) that Peale found in New York State. Peale worked with his son to mount the skeleton for display. The display of the "mammoth" bones entered Peale into a long-standing debate between Thomas Jefferson and Comte de Buffon. Buffon argued that Europe was superior to the Americas biologically, which was illustrated through the size of animals found there. Jefferson referenced the existence of these "mammoths" (which he believed still roamed northern regions of the continent) as evidence for a greater biodiversity in America. Peale's display of these bones drew attention from Europe, as did his method of re-assembling large skeletal specimens in three dimensions. The museum was among the first to adopt Linnaean taxonomy. This system drew a stark contrast between Peale's museum and his competitors who presented their artifacts as mysterious oddities of the natural world. The museum underwent several moves during its existence. At various times it was located in several prominent buildings including Independence Hall and the original home of the American Philosophical Society. In 1762, Peale married Rachel Brewer (1744–1790), who bore him ten children, most named for Peale's favorite artists, male and female. The sons included Raphaelle Peale (1774–1825), Rembrandt Peale (1778–1860), who was another famous portrait painter and museum owner/operator in Baltimore, and scientific inventor and businessman, Titian Peale I (1780–1798), and Rubens Peale (1784–1865). Among the daughters: Angelica Kauffman Peale (named for Angelica Kauffman, Peale's favorite female painter) married Alexander Robinson, her daughter Priscilla Peale wed Dr. Henry Boteler,  and Sophonisba Angusciola Peale (named for Sofonisba Anguissola) married Coleman Sellers. After Rachel's death in 1790, Peale married Elizabeth de Peyster (d. 1804) the next year. With his second wife, he had six additional children. One son, Franklin Peale, born on October 15, 1795, became the Chief Coiner at the Philadelphia Mint. Their youngest son, Titian Ramsay Peale (1799–1885), became an important naturalist and pioneer in photography. Their daughter, Elizabeth De Peyster Peale (1802–57), married William Augustus Patterson (1792–1833) in 1820. Hannah More, a Quaker from Philadelphia, married Peale in 1804, becoming his third wife. She helped raise the younger children from his previous two marriages. Around 1804, Peale obtained the American patent rights to the polygraph from its inventor John Isaac Hawkins, about the same time as the purchase of one by Thomas Jefferson. Peale and Jefferson collaborated on refinements to this device, which enabled a copy of a handwritten letter to be produced simultaneously with the original. Peale wrote several books, among which were An Essay on Building Wooden Bridges (1797) and An Epistle to a Friend on the Means of Preserving Health (1803). Peale named all of his sons for artists or scientists, and taught them to paint. Three of them, Rembrandt, Raphaelle, and Titian, became noted artists in their own right. He was the brother-in-law of Nathaniel Ramsey, a delegate to the Congress of the Confederation. Three of his sons, Rembrandt Peale, Raphaelle Peale, and Titian Peale, became noted artists as well. The World War II cargo Liberty Ship S.S. Charles Willson Peale was named in his honor. George Escol Sellers, grandson who was an inventor. Visual art of the United States or American art is visual art made in the United States or by U.S. artists. Before colonization there were many flourishing traditions of Native American art, and where the Spanish colonized Spanish Colonial architecture and the accompanying styles in other media were quickly in place. Early colonial art on the East Coast initially relied on artists from Europe, with John White the earliest example. In the late 18th and early 19th centuries, artists primarily painted portraits, and some landscapes in a style based mainly on English painting. Furniture-makers imitating English styles and similar craftsmen were also established in the major cities, but in the English colonies, locally made pottery remained resolutely utilitarian until the 19th century, with fancy products imported. Rembrandt Peale was an American artist and museum keeper. A prolific portrait painter, he was especially acclaimed for his likenesses of presidents George Washington and Thomas Jefferson. Peale's style was influenced by French Neoclassicism after a stay in Paris in his early thirties. Titian Ramsay Peale was an American artist, naturalist, and explorer. He was a noted scientific illustrator whose paintings and drawings of wildlife were known for their beauty and accuracy. He participated as a naturalist in several scientific surveys, in particular he accompanied Stephen Harriman Long in 1819 to explore the Rocky Mountains and later served on the United States Exploring Expedition (1838-1842). Charles Peale Polk was an American portrait painter and the nephew of artist Charles Willson Peale. Raphaelle Peale is considered the first professional American painter of still-life. The Peale Museum, officially the Municipal Museum of the City of Baltimore, was a museum of paintings and natural history, located in Baltimore, Maryland, United States. It occupied the first building in the Western Hemisphere to be designed and built specifically as a museum. The museum was created by Charles Willson Peale (1741–1827) and his son Rembrandt Peale (1778–1860). It functioned separately as Baltimore City's historical museum since the original structure was being rebuilt, restored, and renovated in 1930–1931, and then merged with other historic sites, houses and museums in the early 1980s under the expansive efforts of a new executive director, with the name of the Baltimore City Life Museums and a broader mission in conjunction with the other historical locations/sites/structures in Baltimore. James Peale was an American painter, best known for his miniature and still life paintings, and a younger brother of noted painter Charles Willson Peale. The La Salle University Art Museum is located in the basement of Olney Hall at La Salle University in Philadelphia, Pennsylvania. The museum features six galleries. Collections include European and American art from the Renaissance to the present. Special collections including paper, Japanese prints, rare illustrated Bibles, Indian miniatures, African carvings and implements, Pre-Columbian pottery and Ancient Greek ceramics. Changing exhibits are held of historic and contemporary art drawn from the collections and from outside collections. The Artist in His Museum is an 1822 self-portrait by the American painter Charles Willson Peale (1741–1827). It depicts the 81-year-old artist posed in Peale's Museum, then occupying the second floor of Independence Hall in Philadelphia, Pennsylvania. The nearly life-size painting is in the collection of the Pennsylvania Academy of the Fine Arts. Anna Claypoole Peale was an American painter who specialized in portrait miniatures on ivory and still lifes. Belfield, also known as the Charles Willson Peale House, was the home of Charles Willson Peale from 1810 to 1826, and was declared a National Historic Landmark in 1965. The Belfield Estate was a 104-acre (42 ha) area of land in the Logan section of Philadelphia, Pennsylvania, much of which is now a part of La Salle University’s campus. Rubens Peale was an American museum administrator and artist. Born in Philadelphia, he was the son of artist-naturalist Charles Willson Peale. Due to his weak eyesight, he did not practice painting seriously until the last decade of his life, when he painted still life. A physiognotrace or physionotrace is an instrument designed to trace a person's physiognomy, most specifically the profile in the form of a silhouette: it originated in France where it is known as the physionotrace. The instrument is a descendant of the pantograph, a drawing device that magnifies figures. Sarah Miriam Peale was an American portrait painter, considered the first American woman to succeed as a professional artist. One of a family of artists of whom her uncle Charles Willson Peale was the most illustrious, Sarah Peale painted portraits mainly of Maryland, Pennsylvania and Washington, D.C. notables, politicians, and military figures. Lafayette sat for her four times. James Claypoole, Sr. was an American portrait painter, house painter and glazier. He was born in Philadelphia, Pennsylvania, the son of Joseph Claypoole (1677-1740/41) and his second wife Edith Ward Claypoole. He died in Philadelphia. Anson Dickinson was an American painter of miniature portraits who achieved fame during his lifetime, producing a very large number of works, but who is now largely forgotten. Moses Williams (1777–c.1825) was an African-American visual artist who was particularly well known as a maker of silhouettes. He was a former slave of the artist Charles Willson Peale. Hetty Benbridge was an American painter of miniature portraits. ↑ "Maryland Historical Markers: Birthplace of Charles Willson Peale". Maryland Historical Trust. Maryland Historical Society. Archived from the original on 12 April 2018. Retrieved 5 October 2018. ↑ Barratt, Carrie Rebora, and Lori Zabar (2010). American Portrait Miniatures in the Metropolitan Museum of Art . New York: Metropolitan Museum of Art. p. 34. ISBN 1588393577. ↑ Alexander, Edward P. (1995). Museum Masters: Their Museums and Their Influence. Rowman Altamira. pp. 43–72. ↑ From Slave Ship to Harvard: Yarrow Mamout and the History of an African ... p. 149. ↑ DuBois Shaw, Gwendolyn (March 2005). "Moses Williams, Cutter of Proﬁles: Silhouettes and African American Identity in the Early Republic" (PDF). Proceedings of the American Philosophical Society. 149 (1). Archived from the original (PDF) on 2015-05-01. Retrieved 8 March 2015. ↑ Penley Knipe (2002). "Paper Profiles: American Portrait Silhouettes". Journal of the American Institute for Conservation. 41 (3): 203–223. doi:10.1179/019713602806082575. Wikimedia Commons has media related to Charles Willson Peale . The Winterthur Library Overview of an archival collection on Charles Willson Peale. Union List of Artist Names, Getty Vocabularies. ULAN Full Record Display for Charles Willson Peale. Getty Vocabulary Program, Getty Research Institute. Los Angeles, California.